Mellotoon sure sounds pretty - and EZkeys itself is ace - but with its limited tonal palette, it could hardly be described as a must-have. Tapes sound crusty and evocative. 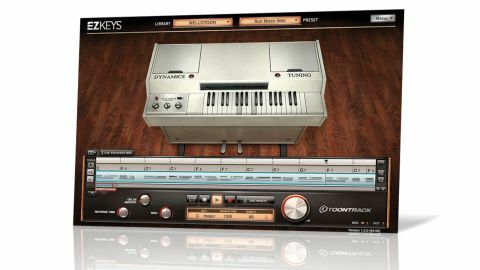 The latest extension to Toontrack's EZkeys line of songwriting and virtual keyboard software (plugin and standalone; £55 as an expansion for existing owners) is a multisampled Mellotron M400. "Alongside the main presets are five 'mixed instruments' and four pads"
The Mellotron was a legendary tape-based instrument made famous by the likes of Genesis and The Beatles, and often cited as the forerunner to the sampler. 15 of its tapes have been captured, including Flute, Cello, String Section and Boys Choir, each one opening with its own set of adjustable parameters (reverb, Brilliance and Presence for Cello, for example), and all sounding fabulously crusty and evocative. Alongside the main presets are five "mixed instruments" and four pads (layered and processed combinations), but even with those, it's a very restrictive soundset, thanks to the inherent limitations of the source instrument.